Some other answers modify String.prototype (this answer used to as well), but I would advise against this now due to maintainability (hard to find out where the function is being added to the prototype and could cause conflicts if other code uses the same name / a browser adds a native function with that same name in future). According to the comments below this doesn't work in IE 7 or below. Here are the fastest methods based on this jsperf test (ordered from fastest to slowest). As you can see, the first two methods are essentially comparable in terms of performance, whereas altering the String.prototype is by far the slowest in terms of performance. "capitalize just the first word".capitalize(); ==> "Capitalize just the first word"
"capitalize all words".capitalize(true); ==> "Capitalize All Words"
_.capitalize(string) Converts first letter of the string to uppercase. _.capitalize("foo bar") == "Foo bar"
Despite being called ::first-letter, it applies to the first character, i.e. in case of string %a, this selector would apply to % and as such a would not be capitalized. In IE9+ or IE5.5+ it's supported in legacy notation with only one colon (:first-letter). parameters => function is so called arrow function. I went with name capitalizeFirstChar instead of capitalizeFirstLetter, because OP didn't asked for code that capitalizes the first letter in the entire string, but the very first char (if it's letter, of course). 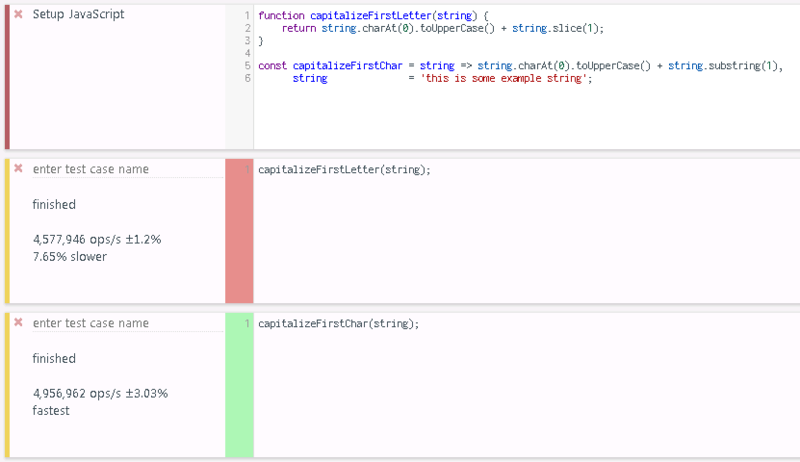 const gives us the ability to declare capitalizeFirstChar as constant, which is desired since as a programmer you should always explicitly state your intentions. In the benchmark I performed there was no significant difference between string.charAt(0) and string. Note however, that string would be undefined for empty string, so it should be rewritten to string && string, which is way too verbose, compared to the alternative. string.substring(1) is faster than string.slice(1). 4,577,946 ops/s ±1.2% for the most voted answer. Created with JSBench.me on Google Chrome 57. This is from CSS text-transform Property (at W3Schools). ucfirst("this is a test") --> "This is a test"
It works by splitting the string into two pieces. On the first line it pulls out firstLetter and then on the second line it capitalises firstLetter by calling firstLetter.toUpperCase() and joins it with the rest of the string, which is found by calling str.substr(1). The ucfirst function works if you do it like this. Thanks J-P for the aclaration. I found this arrow function easiest. 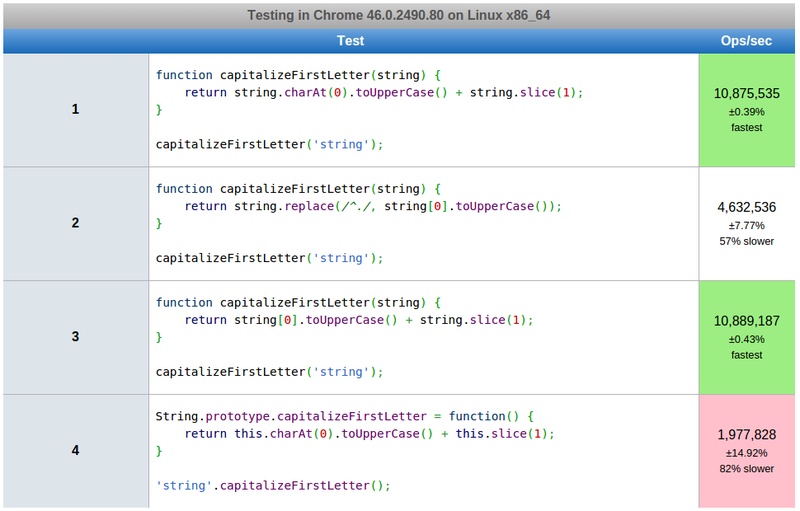 Replace matches the first letter character (\w) of your string and converts it to uppercase. Nothing fancier necessary. How do I make the first letter of a string uppercase? How can I make the first letter of a variable always capital? How to downcase all char and uppercase only the first characters via js?